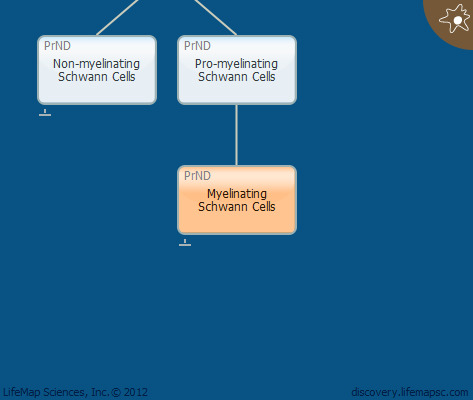 Myelinating Schwann cells form the myelin sheaths that surround peripheral nervous system axons. The myelin sheath is composed of compacted layers of the Schwann cell membrane, which is predominantly lipid, but contains several proteins that take on key roles in maintaining the structure and compaction of the myelin and adhesion of the sheath to the axon. One Schwann cell myelinates one axon, whereas one oligodendrocyte, the myelin-synthesizing the glia of the central nervous system, typically myelinates many axons. The axons with a diameter exceeding 1-2µm release myelination signals, which stimulates myelin production. The myelin enwraps the axon in segments that are separated by nodes of Ranvier. Schwann cells act as an electrically insulating sheath, thus, signals are propogated along the axon in a series of jumps from node to node, in a process called salutatory conduction. In this manner, the need for action potential regeneration at every point of axonal membrane is eliminated, thereby reducing metabolic requirements for neural activity. Schwann cells are also important for providing support and nutrition to the axons.